As many readers of this blog already know, I almost never use packaged pectin. After writing a whole book about old-fashioned fruit preserves, made as they were before packaged pectin was invented, I’ve felt no need for Sure-Jell or MCP or any such stuff. 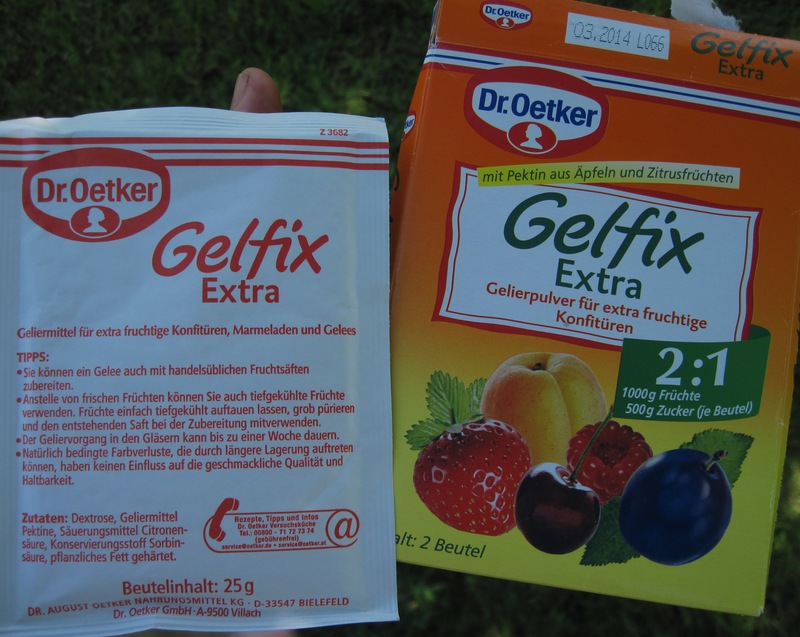 But recently Nadia Hassani, who wrote about her own experiment with pectins in her blog “Spoonfuls of Germany,” told me how much she liked Dr. Oetker’s Gelfix, a pectin mix from her native Germany, and offered to send me some. Gelfix seems to be sold all over Europe, but in the United States it can only be ordered through the Internet. I said I’d try it. I decided to compare the Gelfix with a new product from Ball, a pectin mix that comes in a small plastic jar instead of a box, with flexible instructions that allow you to vary both the batch size and the sugar content. 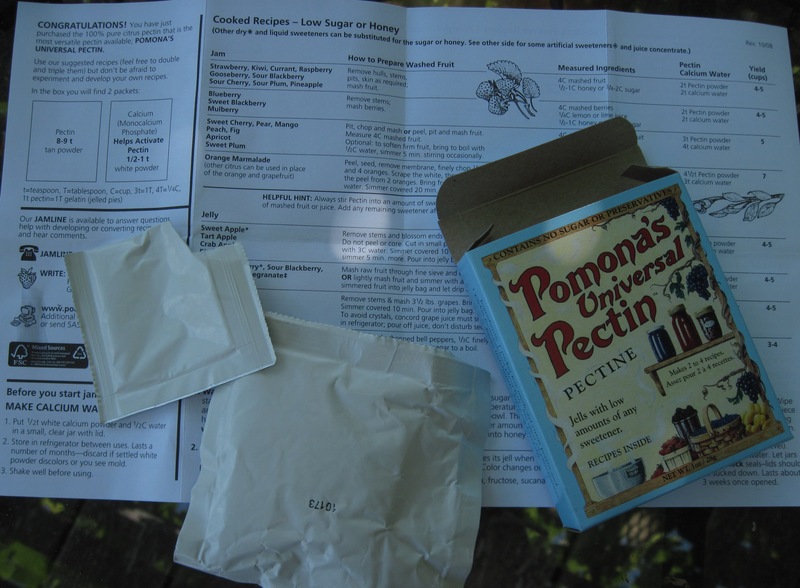 And then I saw a box of Pomona pectin at Nichols Garden Nursery and decided to include it in the test, too. Available mainly from special sources like Nichols and food co-ops (though some supermarkets are beginning to carry it), Pomona also offers flexible recipes, which allow the use of little sugar or even none at all. I pulled bags and bags of frozen raspberries out of the freezer. I was accustomed to making raspberry jam with nothing but sugar and a little lemon juice added. My raspberry jam took a few minutes of boiling to set, but it always set to a pleasant, soft gel, and never turned out stiff or sticky or syrupy. How would I like raspberry jam made with these specialty pectins? I started by examining the packages. Gelfix pectins are made from both apple pomace and citrus peels. The Classic and Extra versions contain dextrose, a form of sugar that’s included in Sure-Jell and Ball pectins as well and that’s replaced by the fructose in Gelfix Super. Gelfix Extra and Gelfix Super contain sorbic acid, a preservative, apparently to retard the fermentation and mold growth to which low-sugar jams are prone. All three Gelfix versions contain citric acid, which takes the place of the lemon juice traditionally added to jam to aid in gelling. All three also contain hydrogenated vegetable oil, which I imagine is meant to replace the traditional pat of butter that helps keep the jam pot from boiling over. The fat must be in a very small amount and somehow granulated, because the Gelfix pectin mixture is a powder, not a paste. The Gelfix box contains two packets, each of which makes at least two and a half pints of jam. On the Internet I found prices for Gelfix ranging from $4.65 to $5.95 per box. At $5.00 per box, probably about the best you could do with shipping included, Gelfix would add about a dollar per pint to the cost of your jam. Keep in mind that the Gelfix instructions are in German. Sprechen Sie Deutsch? Ball. I turned to the Ball product, called RealFruit [sic] Classic Pectin. Again that word classic. I began to understand that this is a code word for old-fashioned high-methoxyl pectin, the kind that requires a high sugar content for good gelling.1 Only two other ingredients are listed on the label, pectin (from citrus, apple, or both, the label doesn’t say) and citric acid. Ball’s Classic Pectin, in other words, has the same ingredients as Gelfix Classic except for the vegetable fat. I couldn’t have known this without checking the Web. Here in Oregon, Ball’s new products, unlike the company’s mason jars and lids, are only slowly gaining acceptance in supermarkets and other stores. Ball’s Pickle Crisp is another product that none of the stores in my area have stocked. I’d never seen Ball pectin of any kind until I found it at Bi-Mart, a low-cost dry-goods store that caters to rural folk here in the Northwest. Now my raspberries were thawed and waiting. I decided to carry on my experiment with Ball’s Classic Pectin. Ball’s sturdy peel-back label reseals against the jar time after time. The instructions inside the Ball pectin label surprised me. 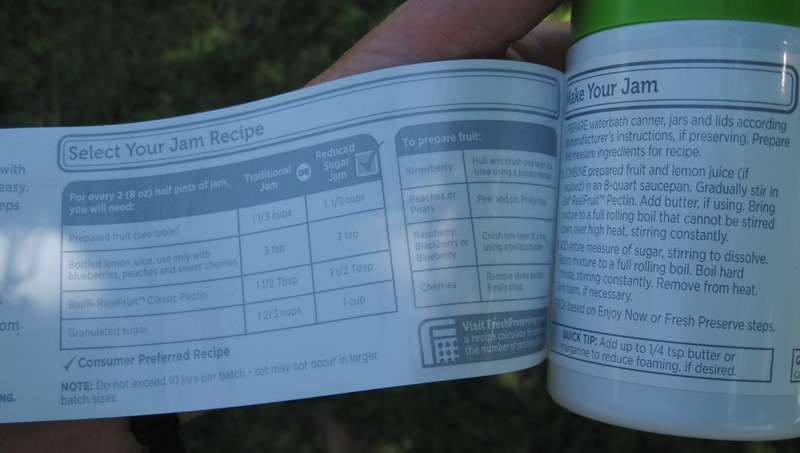 There were two recipes, one for “Traditional Jam” and one for “Reduced Sugar Jam,” identical except for the amounts of sugar called for. Packages of old-fashioned high-methoxyl pectin are full of warnings: You must never alter the quantity of sugar, or your jam will fail! The Ball pectin, I figured, must be all or partially amidated, or subjected to a treatment with ammonia that makes high-methoxyl pectin behave more like low-methoxyl pectin, the kind that requires little or no sugar but gels in reaction with calcium. Normally, low-methoxyl pectins require added calcium for making jam. Amidated pectins do not; they are much less fussy about calcium levels. Jams and jellies made with amidated pectins are unusual, too, in that they will regel after you melt them. The Ball pectin isn’t so old-fashioned after all. Ball’s “Traditional” recipe calls for 1 2/3 cups sugar to 1 1/3 cups chopped or mashed fruit. A weight measurement would be more precise, and also more useful for comparison with the Gelfix proportions. But the old saw “A pint is a pound the whole world round” proves more or less accurate for both mashed raspberries and granulated sugar. So the recipe calls for at least as much sugar as fruit, by weight. Truly traditional jam making, without packaged pectin, typically calls for three parts sugar to every four parts fruit, by weight, though you’d use less sugar with low-pectin fruits and more with high-pectin, high-acid fruits. Ball’s recipe is typical not for no-pectin-added jams but for jams made from high-methoxyl pectins, the only kind sold before the 1980s. Ball’s “Reduced Sugar” recipe calls for much less sugar, only 1 cup for 1 1/3 cups chopped or mashed fruit. This is more in line with traditional jams. Still, I balked at the either-or choice. The label seemed to be telling me that the pectin could make good jam with a standard amount of sugar or a very high amount of sugar, but not with some amount in between. Why couldn’t there be a single recipe with the sugar amount specified as a range? Most likely, I figured, the marketing people at Ball think consumers can’t handle choices that aren’t black and white. But the Ball instructions offer cooks another, more flexible choice: that of batch size. Here’s another command you may remember from boxes of high-methoxyl pectin: Never alter the batch size! If you don’t have quite enough berries, go pick some more! If you have too many, leave them out! Actually, traditional jam makers have to be careful about batch size, too. If your batch is too big for your pot, for one thing, your jam will boil over. For another thing, evaporation is part of the process of reaching the gel point. A bigger batch has proportionately less surface area and so will gel more slowly. Also, natural pectin reacts best when both heating and cooling are rapid. The Ball label invites multiplying the recipes but warns against exceeding ten jars per batch. You have to do a little figuring to understand out what this means: If the basic recipe makes two half-pints, the ten jars referred to must be half-pint jars. So you can multiply the recipe by five, but no more. The Ball jar contains enough pectin, according to the label, to make up to 22 half-pints. You’d fill fewer jars with less added sugar, but even with the reduced-sugar recipe you should be able to fill 18 half-pint jars. The 4.7-ounce pectin container costs about five dollars, so using the low-sugar recipe with Ball Classic Pectin would add about 27 cents per pint to the cost of your jam making. At least in the United States, the Ball product is considerably cheaper than the Gelfix product. Pomona. The last brand in my study contains no added sugar at all.3 The list of ingredients on a box of Pomona’s Universal Pectin is brief and precise: “1 packet low methoxyl citrus pectin and 1 packet monocalcium phosphate.” Low-methoxyl pectins need calcium to form a gel, but they can gel with less sugar and less acid than can high-methoxyl pectins. So no citric acid is included in the Pomona package, and with higher-acid fruits adding lemon juice is optional. The monocalcium phosphate, the Pomona instructions say, is to be combined with water. You mix ½ teaspoon of the powder with ½ cup water, and you store this “calcium water” in the refrigerator, where it will keep for months. Although the Pomona instructions call for adding calcium water to every kind of fruit, too much calcium can interfere with gelling. So the amount of calcium water called for varies from 2 to 4 teaspoons per four cups fruit or juice. You shake the jar just before you measure some out. Inside the Pomona package are recipes for low-sugar jams and jellies, no-sugar-added jams, and uncooked freezer jams. My favorites are the all-purpose recipes for cooked jam and jelly sweetened with a little sugar (1/4 to ½ cup per 1 cup fruit) or honey (1/8 to 1/3 cup per 1 cup fruit). For jam, you use ½ to ¾ teaspoons pectin for 1 cup fruit; for jelly, you use a little more pectin, ¾ to 1 teaspoon per 1 cup fruit. Otherwise the two recipes are the same. You refine these basic recipes according to the amount of fruit you want to use and how sweet your jam or jelly to be. These recipes are much more flexible than Ball’s. The price of a box of Pomona pectin varies from about four to six dollars per box. A box contains 8 to 9 teaspoons pectin. This makes four batches of berry jam, if you use 4 cups of prepared berries per batch. Depending on how much sugar you add, your output will be 18 to 20 half-pint jars of jam. At $5.00 per box, the pectin would add 25 to 28 cents to your costs per jar, about the same as for the Ball pectin. I had thawed enough berries to make four batches of jam with about 2 pounds of fruit per batch. I used Ball’s “Reduced Sugar” recipe (1 cup sugar per 1 1/3 cups prepared fruit) for the best comparison with the Gelfix recipe (1 pound sugar per 2 pounds fruit). With the Pomona pectin, I made two batches of jam, one with 1 cup sugar per 2 cups fruit, and another with ½ cup sugar per 2 cups fruit. The process differed slightly among the brands. With Gelfix, you boil the fruit, sugar, and pectin together for 3 minutes before testing a drop of jam on a chilled dish. With Ball, you bring the fruit and pectin to a full boil, stir in the sugar, and boil hard for 1 minute. With Pomona, you stir the pectin into the sugar, bring the fruit and calcium water to a boil, add the pectin-sugar mix, and boil hard for 1 to 2 minutes. Since I like a softer set, I chose a 1-minute boiling time with the Pomona pectin. In all cases, the boiling was brief enough to produce a pinkish rather than dark red jam. In all cases, too, the jam set up quickly. As soon as I would take the pot off the heat, the surface of the jam would wrinkle with any disturbance; this is a sure sign of gelling. With the Ball pectin, the jam was clumping as I filled the last jar. Although the Gelfix instructions say nothing about boiling-water processing, which isn’t normally done in Europe, I processed all the jars the same way. I sterilized them first in the canner, and after filling and closing them I gave them a 5-minute boiling-water bath. While my son Ben and his wife were visiting, we held a blind jam tasting with warm biscuits. We had to work at identifying differences among the jams—except in the case of the very-low-sugar Pomona, which lacked the sheen of the others and tasted more tart. To me, this stuff looked and tasted like cooked puréed fruit, not jam, but my husband, Robert, actually preferred its fruitier, less sugary flavor. The other, sweeter Pomona jam was a bit softer than the rest, probably because I’d given it the minimal boiling time. The Gelfix jam, which turned out slightly softer than the Ball, was Robert’s favorite. Deanna preferred the Ball, and Ben was torn between the not-so-low-sugar Pomona and the Ball jam. Most interesting to me was this: No one could tell that the Ball jam had more sugar. Gelfix works well if you can get it, if you can read or translate the German instructions, and if the price and the addition of vegetable fat don’t put you off. Ball’s RealFruit Classic Pectin is cheaper than Gelfix but requires more sugar. If you want to make your jam with less sugar, look for Ball’s Low or No-Sugar Needed Pectin. 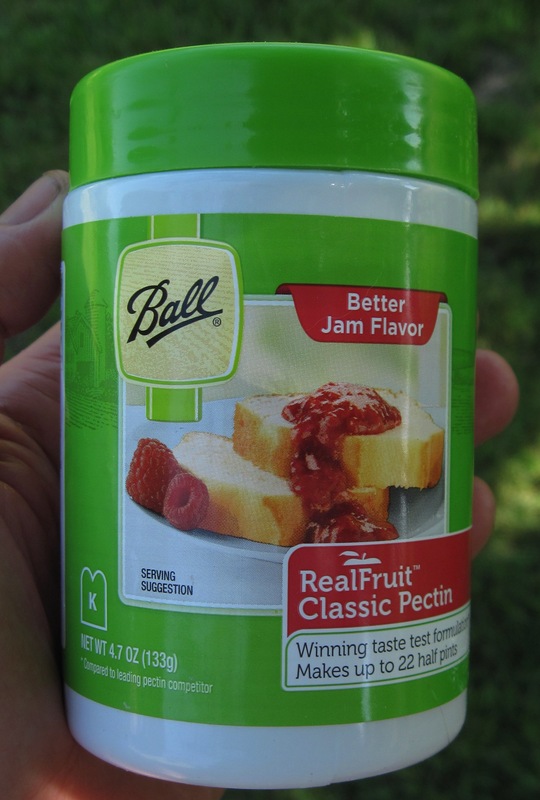 Be sure you don’t buy Ball’s Instant Pectin by mistake; it’s intended only for freezer jam. Pomona pectin costs no more than the Ball mix and is the clear choice among the three if you want to add pectin but not dextrose to your jam. Pomona also allows more flexibility in the amount of sugar you add to your jam than does either of the other products I tested. The necessity of adding calcium water is little bother. The only problem I see with Pomona is its limited availability. To encourage your local store to carry it, send your name and your store’s name and address to info@pomonapectin.com. One final suggestion: For truly traditional jam, try making it without added pectin. Use three parts sugar to four parts mashed raspberries, and add a squirt of juice from a fresh lemon. The process is simple and quick, and the result is delicious. 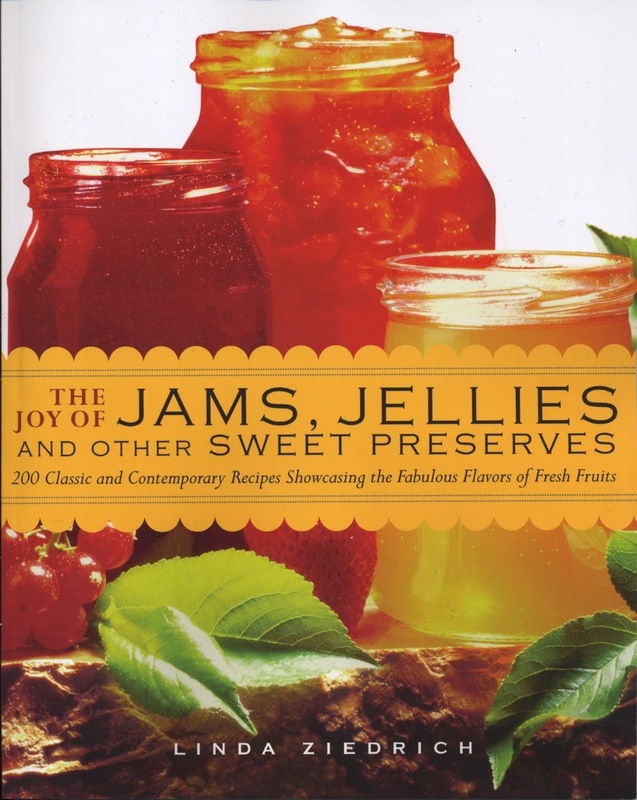 For more information, see The Joy of Jams, Jellies, and Other Sweet Preserves. 1. The main component of pectin is something called galacturonic acid. Molecules of this acid have groups of atoms called carboxyl groups. In nature, about 80 percent of these carboxyl groups are esterified with methane—in other words, turned to esters, groups of atoms that give fruits their fruity aromas. Methoxyl refers to a methane group, CH3, that is attached to a larger organic molecule through an oxygen atom. This arrangement is commonly described as R-O-CH3, with R representing the larger molecule. The linkage by way of an oxygen atom is also called an ester linkage. When pectin is extracted, the proportion of esters decreases, to a varying degree. The ratio of esterified to non-esterified galacturonic acid determines the behavior of pectin in making jam and jelly. So pectins are classified as high-methoxyl (or HM, or high-ester) or low-methoxyl (or LM, or low-ester), depending on whether more or less than half of the galacturonic acid is esterified. As far as I know, Pomona is the only pectin packaged for home preservers that is identified on the package as low- or high-methoxyl. 2. Ball’s Low or No-Sugar Needed Pectin contains dextrose, pectin, citric acid, and calcium ascorbate. The last ingredient helps preserve color while presumably providing the calcium needed for low-methoxyl jams to gel. 3. When figuring how much sugar you’re adding to your jam, you must account for how much sugar is in your pectin package. Nadia had informed me that, for a given weight of fruit to be prepared, Sure-Jell is heavier than Gelfix. The weight is mainly in sugar, in the form of dextrose. I compared the Ball mix with the other two in this way: If 1 kilo fruit makes 6 cups “Reduced Sugar” jam with the Ball pectin, and the 133-gram jar contains enough pectin to make 18 cups of this jam, then we can figure that the Ball mix would add 44 grams per kilo of fruit, compared with 32 grams per kilo for Sure-Jell and 25 grams per kilo for Gelfix. These differences, to me, are minor. But I appreciate that Pomona leaves the addition of sugar entirely up to the jam maker. This entry was posted in Books and blogs, Fruits, Preserving science, Sweet preserves and tagged Ball, Gelfix, jam, Jarden, methoxyl, pectin, Pomona, preserving, raspberry. Bookmark the permalink. Recently I helped at a jam making class sponsered by a local fruit/vegetable market. They sold Mrs. Wage products, so that wha what we used for the class. I’d never used it before and the method is a bit different from Ball and Pomona pectins. Mrs Wage is also sold at BiMart and I’ve seen it at some grocery stores as well. I believe the price is comperable to Ball. The recipe included a no sugar batch using 4 cups of fruit, or a sugared (1-4 cups sugar) batch using 5 cups of fruit. The class voted to make no sugar jam. The logan berries were a bit tart and I think thy would have tasted better with some sugar. The jam set up quickly and the color was inviting. The jam tasted just like the berries. Now I want to go buy a package and see what all is in it and how it compares to the Ball and Pomona pectins I have used for years. Thanks for the comprehensive evaluation and the chemistry lesson! I have used Ball’s No Sugar pectin for pepper jellies before, and have found the results to be acceptable (no cloudiness as some have noted with powdered pectin). Set varied with how much I used(obviously) – I prefer a softer set as well, especially with a pepper jelly, so found that using 1-1.5 Tbsp per batch instead of the entire 1.75oz/49g package gave me the set I wanted. But I’ve heard reports that Pomona gives a chalky or gritty “feel” to the jelly – I haven’t tried it since I haven’t found it locally. You didn’t mention anyone commenting on it during your taste test – what was your experience? Ball now sells the No Sugar version in the same 133g jar you found the Classic pectin in, the label says it makes up to 22 half pints (but I guess that depends on how much sugar you add). Look for the orange (rather than red) on the label. W*lmart sells the Ball products and some of the Mrs. Wages (which I haven’t tried). Sheila and Deb, thanks for the interesting comments. We didn’t notice any chalkiness or grittiness with the Pomona, but I’d expect this to be more apparent with jelly than with jam. I found Ball pectin for no-sugar-added jam in a store for the first time today. I didn’t buy any, but one of these days I’ll have to test it along with Mrs. Wage’s–and maybe Sure-Jell, too. I’ve had great results with Pomona Pectin with strawberries, and find the shortened cooking time a flavor boost. However, recipes with a larger amount of sugar I have found to have the grittiness. The results are not consistent, but do happen with higher sugar recipes. thanks for this post, it was very informative! I go back and forth with using packaged pectin–I do find it is soooo quick so sometimes I do one batch of that and another batch of something that is more involved or requires more cooking time. I’ve been using the Ball Low Sugar (the one available in bulk)–I love the flexibility of the recipe, although the texture of the finished jam is not my favorite. Lately I’ve been going back to Sure-Jell lower sugar–it is not at all flexible, and requires more sugar than the Ball, but for things like apricot or sour cherry, I find that the amount of sugar is just right and I prefer the finished texture. Thanks for that information, Barbara. In the old days (in chemistry class), dextrose was just another name for glucose. Additionally, fructose and glucose differ little in their amounts of carbon, etc – so minimal calorie savings by using fructose rather than dextrose. Excellent post! Really appreciate the time, care, and intentionality of your experiment. Great write up Linda! Thanks so much for being such an incredible resource. 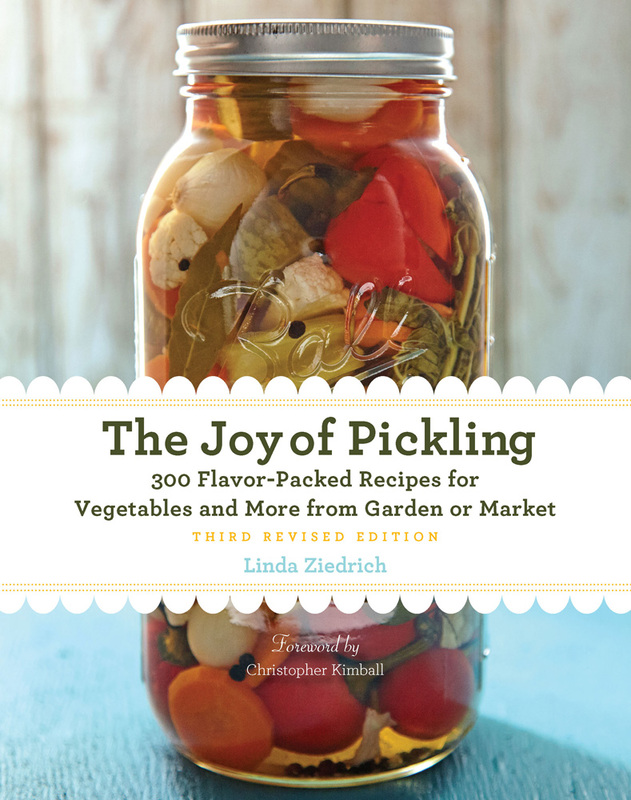 I have both of your books and love them 🙂 I own a jam and pickle company–I never use commercial pectin in any of my jams and probably never will. I make pectin from Granny Smith Apples to add to my Blueberry and Jalapeno Jams, for cherries I puree a quarter of the batch and leave the balance in halves and it works perfectly to get a loose set. I really appreciate you taking the time to experiment with the pectin and do such a thorough write up. As with other apples, slice the unpeeled fruit through the core, cover the slices with water, simmer them until they are tender, and let the juice drip through a jelly bag. Boil the juice to reduce it by half. Wonderful post. Thank you for all your diligent reading and testing. My favorite pectin over the last 30 years or so has been Sure-Jell low sugar for precisely the reason so many of us like the lower sugar versions — they just taste fruitier. More fruit, less sugar. I have had mixed results with attempts at making the no-added-pectin jams. I think it must be the kind of thing where you try, try again to figure out where the proper gelling point is. I’m also suspicious that my candy thermometer may be off, because last time I tried it and stuck to the strict temperature reading the recipe recommended, I ended up with the stickiest, gloppiest mess ever 😦 Thanks again for this post. Fascinating how all the pectins are slightly different . . .
It’s best to calibrate a thermometer before each use, but the important thing is to rely less on the thermometer than on your senses. When jam is ready it looks jammy–that is, thickened and unified, so the liquid no longer separates from the solids. The jam will drop slowly, thickly, from a raised spoon. At this point you take the pot off the heat and test a drop in a chilled dish. If the drop mounds slightly, and if the jam doesn’t run when you tip the dish, the jam is ready. here in the Mid-Atlantic states, we also have a pectin available from the Amish country – Dutch Jell. I can get it at the local Amish Heritage store for $5 a pound, much better priced than the other pectins on the market. I got some for the first time yesterday and I’m wondering how it compares to the others. Gelfix is apparently not available here. I’d appreciate knowing what is in the Dutch Jell mix. Could you tell us the ingredients, Cherry Plum? Linda- I have just found your blog and going through a number of posts. How informative and thorough you are. It’s wonderful! Dutch Jell ingredients are dextrose, fruit pectin, citric acid. I have bought a number of pectin, including Pomona, but have not used them preferring the traditional way, generally using a 80% sugar to fruit ratio by weight. I dislike the hard jellying that I have seen in some jams using added pectin (and some time there has been an unpleasant aftertaste), so I do’;t want to experiment with mine (although I must mean too… otherwise, why would I buy the pectin?) For red fruit with low natural pectin, like cherry or strawberry, I use some currant juice to help set (I grow red currants). I love currants and some juice added to other red fruit taste very pleasant to me: the flavors are complimentary and do not disguise the cherry or strawberry taste.. and of course the color is gorgeous. Apple juice has been good also with peaches and with Cape gooseberries (aka ground cherries). It’s crazy to add pectin to fruit that’s naturally rich in pectin, no? I too combine currant juice with cherries, but I actually like the dependable softness of strawberry or peach jam with nothing added but lemon juice and sugar. I have used the Pomona pectin in a lower sugar strawberry jam. Even without the monocalcium phosphate, I actually found that the jam set a bit harder than I prefer. No odd taste or texture, though. Thank you so very much for your amazingly detailed information. I am new to jamming and preserving. I find too many choices overwhelming. For me, you’ve taken the overwhelming part out of choosing–wonderful! Now I feel I can make truly informed choices rather than, “Welllll, let’s see how this or that works out.” Again, thank you. Now it’s time for me to jam! Have a lovely day. Wow, this is amazing, thank you! I just put up some guava jam using Pomona’s. I googled it when I found it tasted chalky! Sure enough, I’m not alone. I wonder if the effect is more pronounced with certain recipes? I probably won’t use it again. Thanks again for the fantastic research! Alice, it’s interesting to learn that you and other people can apparently taste the very little bit of calcium in jam made with Pomona pectin. Thanks for sharing that information. Alice, you got me to fish my little jar of calcium water out of the back of the refrigerator and taste it. To me it doesn’t taste terrible, just sour. Indeed, Wikipedia says that monocalcium phosphate is acidic. I wonder if this chemical is responsible for the weeping I saw in the jam made with Pomona pectin after a couple of weeks in the refrigerator. For the sake of comparison, I also chomped on a calcium citrate tablet. Now THAT tastes chalky! Linda, thanks for experimenting! Yes, it is sour, I agree. I don’t think I mind the sour part (lots of sour stuff is yummy, like lime juice, etc. ), but there’s another piece for me, on top of the sourness, that I find yucky. I think the word “chalky” is a somewhat inadequate first grasp at the sensation. Have you ever taken one of those zinc lozenges that are supposed to help if you are getting a cold? There is a very strong metallic taste with them that hits the palate a certain way. This taste I’m experiencing is not metallic, but it is reminiscent of the sensation of one of those. It feels similar in the top back of my throat and behind my nose, though the taste is different. Maybe the word “chalky” is used because it connotes a physical experience of taste that is not typical, much like the experience of a zinc lozenge? I think I’m so hung up on it because I put up 15 half pints and one full pint of guava jam made from the fruit of my in-law’s tree…I hope they don’t notice this as I do. Alice, I’m sorry I don’t have a zinc lozenge handy to taste now. But I find that people vary a lot in their sensitivity to particular tastes and aromas. I’ll bet that most people who try your guava jam will love it. In fact, it seems that most people who try Pomona pectin greatly prefer it over the supermarket brands. Thank you, Linda, for your kind reassurance :)! If you ever try a zinc lozenge, I’d love to hear your thoughts. I am hopeful–you are right, the majority of folks seem to really like Pomona’s. Thanks! I’m bookmarking your terrific blog. I had a good time reading through your posts, and will look for your books. What can you do if it doesn’t,t gel? I’d first try to figure out what went wrong. Was the pectin old? Did you follow the instructions on the package? Did you bring the jam to a full boil? Was the fruit tart enough? Should you have added more lemon juice? Then try remaking the jam in this way: Empty the jars into your preserving pan. For each cup of jam combine 1 tablespoon sugar and 1 teaspoon powdered high-methoxyl pectin in a small bowl. Stir in 2 tablespoons boiling water per cup of jam. Add this mixture to the pan. If you think your fruit may have been low in acid, stir in 1 teaspoon lemon juice for each cup of jam. Bring the mixture to a rolling boil. Begin testing it after 30 seconds. Thank you for explaining the chemical process of whats going on when canning with pectin. I want to substitute grass-fed gelatin for the pectin in my strawberry jam without having to use the high amounts of sugar. I would love to stay at a 1:2 ratio if possible. I was wondering what your thoughts would be for combining the method of old world canning-letting it sit for a couple hours to allow the fruit to release its own pectin and adding gelatin to get the jam-like consistency. Would love any feedback or thoughts on it before going at it on my own! Thanks! Kristan, you can use a 1:2 ratio (1 cup, or about 1/2 pound, sugar to 1 pound strawberries) without adding either pectin or gelatin, provided you add lemon juice (2 tablespoons) and use a wide pan, such as a 12-inch skillet. The small quantities and big pan will promote fast cooking and cooling, which will maximize gelling. The jam should be stored in the refrigerator. I have never made jam with gelatin, but here’s a link to an Oregon State University Extension leaflet with information on that topic: http://extension.oregonstate.edu/lane/sites/default/files/documents/sp_50_765_lowsugarfruitspreads.pdf. Note that you can expect a Jello-like texture and that the jam should be refrigerated. I just made a rose petal jelly and it never got thick (its super watery) and I believe this is due to my misuse of the Ball RealFruit Classic Pectin. The recipe called for Pomona’s Fruit Pectin, but I made the mistake of thinking all pectin was the same, despite brand name. Could you tell me how I should fix this recipe? 1&1/2 C filtered water, 2/3 dried rose petals, 2 C organic cane sugar, 3 T fresh lemon juice, and 1 tsp. Pomona’a Fresh Pectin. Recipe can be found: http://www.feastingathome.com/rose-petal-jam/ . I could REALLY use the help! It took me so long to make and I’m disappointed it turned out bad. You’re right, Sarah: The problem is the pectin. Whereas Pomona’s product is pure pectin, Ball’s is a mix of pectin, dextrose (a kind of sugar), and acid. Also, Ball’s Classic pectin is amidated, and so tolerates more fluctuation in calcium levels, but this is less important. The important thing is that you used much less actual pectin than you thought you did. Judging by the instructions on the Ball’s Classic label, I’d say that you should have used 2 1/4 tablespoons, or 2 tablespoons plus a little less than a teaspoon. At this point you can either remake your jelly with added pectin or else label it as rose petal syrup and use it in drinks, sorbet, or ice cream.